Alex Sarkissian, above photo, beat Connor Smith (photo 1), 7-6, 6-4 in all American final, Sunday, July 20. 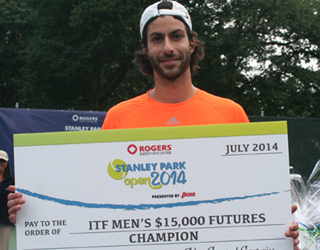 This year's tournament included two ITF Pro Circuit Events - The Men's $15,000 and the Women's $10,000 Futures. Photo 2: In the Women's Open, American Alexa Guarachi needed four match points to overcome top seed Yuka Higuchi of Japan, 6-3, 1-6, 7-6, in the final. Photo 3: Yuka Higuchi teamed up with Japanese Hirono Watanabe in the Women's Open Doubles champions to top Alexa Guarachi and her American doubles partner, Lauren Albanese, 4-6, 6-2, 10-5. Photo 4: From left, Tennis BC Executive Director, Sue Griffin, Tennis BC President, Sarah Dunbar and Sponsor, Canada Direct Insurance. Photo 5: BC's Daniel Chu and his doubles partner, American Kyle Mcmorrow beat Riaan Du Toit and Alejandro Tabilo, 6-2, 5-7, 10-7, in the Men's Open Doubles final. Photo 6: Alejandro Tabilo of Ontario, the top junior player in Canada. Photo 7: Defending champion Katerina Boiko lost in the first round to the second seed, Lauren Albanese, 6-3, 6-2. George Jecminek, the winner of 2012 event, didn't have much of luck either, and lost in the second round to the tope seed, Connor Smith, 6-3, 6-4. Photo 8: Yasmin Mansouri and her mom, Saahel. Yasmin beat top seed Elodie Petrecca, 6-1, 6-1, in the Girls U14 semis but came short and lost in the final to Maya Dukaric, 6-4, 6-3. The champs and challengers events were combined this year for the juniors with no consolation! For the complete Junior results click here. Photo 9: The crowd had waited through a three-hour rain delay for the finals on Sunday. Photos by Gerry Kripps and Mamood Gouneili.